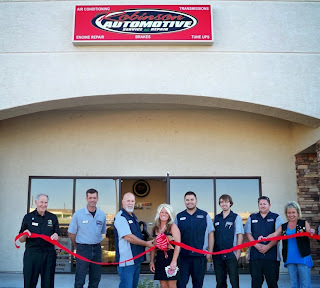 The Lake Havasu Area Chamber Ambassadors held a ribbon cutting ceremony for Robinson Automotive, celebrating its five year anniversary, and grand re-opening. Attending the ribbon cutting from left to right were Russ Mascari, James Fonte, Darrell Robinson, Teresa Robinson, Juli Pichardo, Adam Schrepel, Brian Zempich, and Kathy Baumer. Robinson Automotive has built its business and relationships with its customers based on honesty while striving to provide the best service and repairs possible. Robinson Automotive would like to thank all of its loyal customers and looks forward to many more years of serving the community of Lake Havasu City. For more information contact them at 928-764-1562.